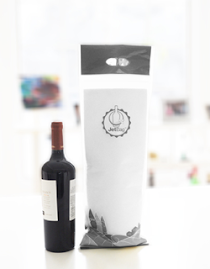 A blog for updates on our new product for transporting wine: the Jet Bag, and other information regarding wine and travel. T-2 days until we hit the Boston Wine Expo! If you happen to be in the area, this is taking place Saturday and Sunday, January 23rd & 24th at the Seaport Convention Center. The Wine Diaper will be there, represented by our Italian team: Marco, Carmine, Alessandro & Roberto. They'll be having specials on the Wine Diapers, giving away bottles of wine, holding demonstrations to show you just how the Wine Diaper absorbs up spills, and highlighting our 2.0 version (coming soon). Stop by our booth #326. We can't wait to meet you! The Wine Diaper is coming to Boston! If you're in the area, stop by the Boston Wine Expo and visit our booth! We'll be in Boston from January 22 - 24th. The Expo has wine seminars, tastings and--oh yeah! Wine Diapers!